Forty percent of adults in the United States consume a grand total of ZERO whole grain servings every day. Not the most encouraging of statistics. Although whole grains are increasingly more available, I suspect this has to do with a lack of education and knowledge. Many people, for instance, think multigrain bread is a whole grain. It’s not. Additionally, the overwhelming majority of new whole grain products come in the shape of sugary cookies or cereals “made with whole grains,” which can mean that as little as 5% of the total wheat flour used is whole. If your whole grain consumption isn’t up to par, here are some ideas. — Whether at home or at a restaurant, opt for brown rice. Kitchen-phobes have no excuse. Many companies now offer brown rice that cooks in 10 minutes in the microwave. Nutritionally, it is equal to regular, longer-cooking varieties. 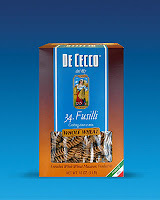 — Enjoy whole wheat pasta, like DeCecco whole wheat fusilli (pictured at right). If you are brand new to it, make your dishes with half regular pasta and half whole wheat. — Eat whole grain bread (at least 3 grams of fiber per slice and ‘whole wheat flour’ as the first ingredient). — Experiment with alternative grains like quinoa and whole wheat couscous (they cook the exact same way as rice. All you need is a pot and water). — Add barley to your soups. — Make sure your morning cereal is whole grain (again, look for whole wheat or oat flour as the main ingredient). — Snack on popcorn (air pop it or make it at home in a pot with a little bit of olive oil). — Make waffles and pancakes with whole grain mixes. If you buy frozen varieties, make sure they are whole grain. Remember, whole grains offer more health benefits than non-whole grains with extra added fiber. If you need more assistance, check out the Whole Grains Council’s amazing and extensive list of whole grain products. It’s the perfect supermarket assistant!